When I open the link to "A Mystical Staircase" I already have countless tabs open in several browser windows. Each tab has been assigned a logo, letters or symbols and pictograms that reference the real world: envelopes (the paper kind only bills come in now), blue boxes, red play buttons, shopping bags, rectangles with the corner folded down. In "A Mystical Staircase," the digital references to physical objects—tarot cards—serves as a curatorial tool. You have a question on your mind? Choose a card and it will present you with a randomly selected artwork—video, image, or sound—by one of 24 international artists included in the show, the third in a trio of projects by curatorial duo Francesco Urbano Ragazzi, following "The III Internet Pavilion" at the 55th Venice Biennale in 2013 and "The Internet Saga," inaugurated on the occasion of the 56th Venice Biennale in 2015. "A Mystical Staircase" is also curated in collaboration with 63rd-77th STEPS. In a common form of tarot reading, you talk through a question or problem. In "A Mystical Staircase," the idea is to ask a question and have an artwork answer it for you. Artists and writers have long been drawn to all things occult, but art is not often summoned to answer questions so directly. More often, it is used to ask them. The association between tarot cards and digital communication technologies is immediate—they are the same shape and size as phone screens. The design and layout of the page, I find out later, also mirrors online tarot card reading sites, with their bitty patterns and awkward combinations of colors and fonts. All the images and videos are in portrait format. But these tarot cards, like all tarot cards, are not like the internet at all really: no one asks search engines proper questions anymore. Eva Papamargariti, Descending Staircase with Hands on It (2016). Upon my return to the main page, the cards have been reshuffled again, and the potential endlessness of this experience starts to become apparent. In this sense, "A Mystical Staircase" offers a “one-card” reading, the simplest form of tarot reading because you think of a question and choose a single card to find your answer, and which the “soul-scrape” section of atworkandbored.com tells me is “so simple and yet so profound.” I get briefly distracted (I am indeed at work and bored) so I ask the tarot deck hosted on atworkandbored.com if I should leave my job. It replies: “STRENGTH—flex your muscles and test your limits. Pour some serious effort into your plans and watch them take off.” I imagine my plans actually flying away and feel even more deflated. I explore some other online divination sites. A free feminist tarot site reads my past, present, and future, which all involve a lot of swords for some reason. The swords in my past card symbolize overcoming despair. In my future there is a ritual killing, “as if the person were some symbolic sacrifice or maybe a scapegoat offered up by the patriarchy or to it in place of others.” This card—the 10 of swords—could signify the end of a delusion, or might mean I need to deal with death. I’m guessing it’s not the death of patriarchy, but there’s always hope. I return to "A Mystical Staircase" feeling more familiar with online divination. I am more focused on questions, but I’m not exactly “working through” the individual thoughts and questions in my head. It’s easy to get frustrated when the same video or image appears a couple of times in a row (it’s also easy to click the return button on your browser, whereupon all the works are arranged in the same place on the page), or when it occurs to me that I might not get to see some of them, even after spending around the same amount of time on the site as I would an offline exhibition. What would be the point in scrolling down to the bottom of the page, if the cards are random each time? Why not just choose the same card each time? "A Mystical Staircase" feels more like an online game with no real logic, which makes sense, seeing as up until the 18th century tarot cards were only used in card games. "A Mystical Staircase" is, like all the best games, kind of pointless. The code for Brent Watanabe’s deer that wanders around a vast and hostile world already existed in the architecture of Grand Theft Auto V—Watanabe just had to modify play so the deer never dies, despite frequent attacks, and acts autonomously. The result is San Andreas Streaming Deer Cam, originally accessed via Twitch and extracted for "A Mystical Staircase." This deer doesn’t need to be reborn to start again—it never dies. We see its hind being shot, blood projecting out onto the floor, but a wound never shows. I experience a brief moment of pointless empathy toward the animal as it falls over and starts to struggle before I remember it a) doesn’t feel pain, b) is completely impervious, and c) isn’t real, and it gets back up unharmed. My next card is by Kareem Lotfy, who shows a video of jeans being distressed by a weird machine. Sections catch fire and glow, creating patterns that look random in a mechanized (controlled) way. Is this the power of heat or electricity? As I keep watching, the video looping, it looks more and more like magic. The notion of a vertical cinema—the standard ratio for video flipped on its side, which is how most people record and watch video on their phones—is at once annoying and increasingly essential. At times the aspect ratio offers a slice of the action, whether it was filmed on an iphone or cut from an existing clip or computer-generated image. Sometimes it works, sometimes it doesn’t. 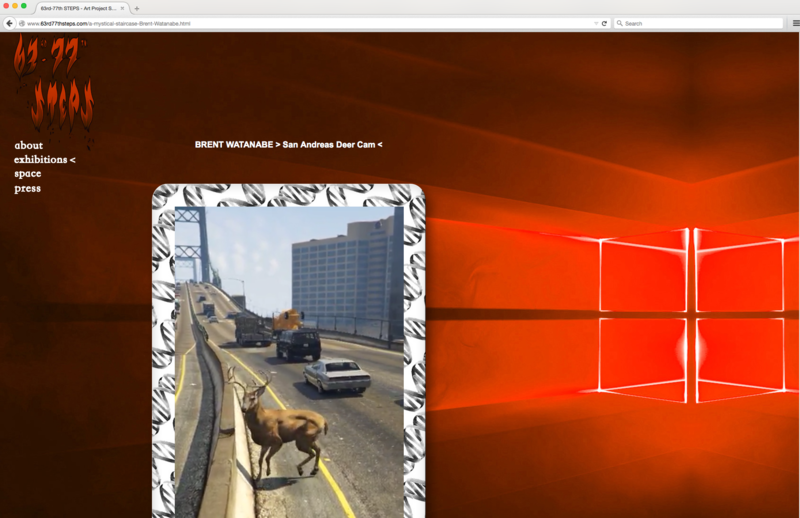 San Andreas Streaming Deer Cam, for example, was produced through modified gameplay, so why is it now shown as a portrait image at the expense of the effective and atmospheric landscape the deer travels through? In Tabita Rezaire’s Peaceful Warrior card, the opposite is the case. Rezaire performs an alluring dance, calling to “decolonize self-care.” Using the tarot card format, she turns her body into a powerful symbol, a living tarot that really does provide an answer to a question: How do we decolonize, rather than “diversify,” the internet? How do we decolonize the art and life and language? And how do we decolonize the mind? Diversity is polite and hopeful: calls for diversity don’t acknowledge colonial oppression, in the way calls for decolonization do. Rezaire summons writer Sara Ahmed’s claim that “Equality and diversity can be used as masks to create the appearance of being transformed,”1 as well as Audre Lorde, who famously wrote, “Caring for myself is not self-indulgence, it is self-preservation and that is an act of political warfare.”2 That’s the thing about tarot: the same cards can stimulate thousands of readings, even, arguably, an infinite amount, as it is specific to the person asking the question. I come away with the feeling that these cards are portals, through which diversified “others” are actually called upon to speak about the material realities of oppression. The curatorial format may initially seem too homogenizing, but for some artists, like Rezaire, the cards open up possibilities. For others, especially the works that originate in a different context, the tarot deck comes off as an arbitrary device for experiencing artwork online. Despite this, the work included is good, and that’s what stays with me. Initially, it felt as though the exhibition is inherently cynical both about the significance assigned to tarot and its ability to answer your most important questions, and toward the suggestion that art can, or should, perform an equally oracular function. Spending some time on the exhibition, though, it becomes clear that despite the restrictions associated with borrowing from real-world phenomena, the specific choices made in "A Mystical Staircase" make space to experience art both visually and emotionally.